The annual Memorial Day Weekend tradition continues this year with the Alabama Jubilee Hot Air Balloon Classic, coming May 25-26 to Point Mallard Park in Decatur! Over 60 hot-air balloons will be on-site at the Classic, along with great food, games, and live music, including 104.3 ZYP presenting Jake Miller on Sunday, May 26th at 6pm! 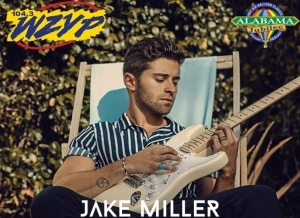 Come out and enjoy the show, with Jake performing his ZYP hit “Wait For You”! CLICK HERE for more info on the Alabama Jubilee Hot Air Balloon Classic, and be sure to stop by and say hi at the ZYP booth on the midway – we’ll have games, giveaways and fun all weekend!